Richard Bach's famous New Age fable, Jonathan Livingston Seagull (1970) was a very popular adolescent motivational read when I was growing up. It was for the 80s what Paulo Coelho's The Alchemist (1993 in English) was for the 90s. It tells the tale of an angsty seagull that, tired of the petty, small-minded life of scrounging for survival, decides to explore the outer limits of flight in order to come fully alive and be the most seagully seagull it could be. It is a very charming breaking-smart story about solving for aliveness rather than survival, but if you know anything about seabirds, also an extremely silly one. For wild seabirds, unlike humans, there is no difference between solving for survival and solving for aliveness. It's almost binary: you're either dead, or you're fully alive. Bird brains are just the right size to solve for specialized survival, with perhaps a little cognitive surplus left over for some curiosity and play. Seagulls are smart, but not smart enough to suffer existential angst on an open-ended spiritual growth path, which is why Richard Bach's tale has always struck me as very silly. Seagulls just aren't a very good species onto which to project human notions of striving and self-realization. There IS however, an ideal species onto which humans can and do project their solving-for-aliveness instincts: corporations. Let's talk about Jonathan Livingston Corporation, a corporation that is tired of the petty, small-minded life of scrounging for margins, and decides it wants to soar high and get more out of its life, while exploring the limits of its own existence. A corporation that wants to solve for aliveness rather than survival, and turn the anthropomorphic projections of its human parts into reality. 1/ One of the reasons I like bird watching is that birds are just so alive. Bird watching is like Japanese forest bathing, but for people who like a little more visible dynamism in the life energies they're bathing in. 2/ Seabirds in large flocks, like the puffins and guillemots in the picture above, which I took at Inner Farne, are particularly good for this. 3/ Seabird colonies are the large urban metros of nature. Huge, dense, noisy, poopy, smelly agglomerations of birds competing for real-estate (cliff-edge property is highly valued), mates, and fish. 4/ Birds that are pelagic (open-ocean dwelling) for most of the year come together in these transient bird-New Yorks for a few months to breed, and it's an astounding sight. The phrase "full of life" comes to mind. 5/ The huge gatherings are like cans of mixed nuts. 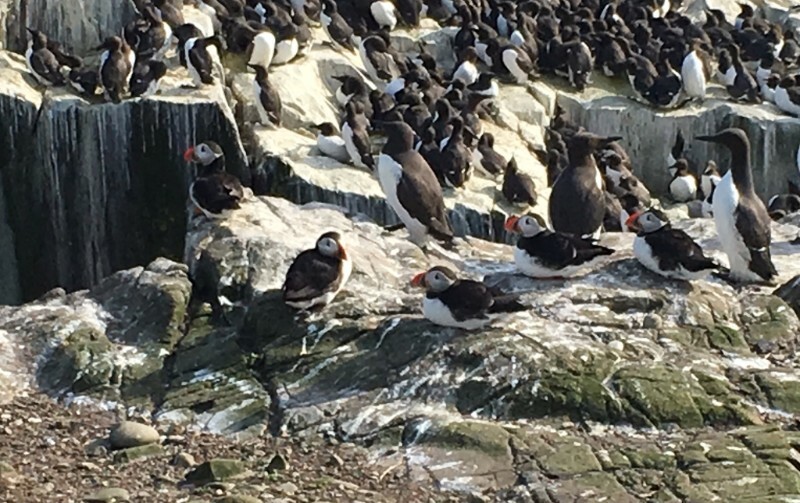 There's usually a plentiful peanut species -- seagulls, egrets, or in this case, guillemots -- and then there are the more charismatic species like puffins and razorbills -- the almonds and cashews. 6/ Humans too, when densely packed into big cities, start to act like seabirds in colonies. Though it is not the wilderness, there is a gritty, survivalist quality to life in big cities. But there's a crucial difference: they come there not to breed but to come alive themselves. Literal human breeding is for smaller towns and suburbs. 7/ This is why there is a strong linkage between thriving urban regions and a thriving economy in the software-eaten world. You need humans who have come alive, or are trying to, to drive a software economy. 8/ You can feel this vitality in thriving business regions during boom times, but it's hard to find such places/times. Business vitality and dynamism in the US, measured formally in terms of rate of new business formation, have been trending down for decades. 9/ You can only enjoy the "scene" and its social/cultural potential -- dating, clubbing, music, food -- for so long. To survive psychologically in the urban cores, you need to take on the project of coming alive personally. And like it or not, the ideal vehicle is usually a corporation. 10/ The world of business is full of problems small and big, easy and hard. You have to raise money, debug designs, fight production fires, snag customer attention, close sales, deal with PR shitshows, morale problems, hiring... the list is endless. 11/ But underneath the complexity of business problem solving is a broader philosophical question: what do you generally solve for when you solve a business problem? And there are two basic answers that are worlds apart: money, and not-money. Survival or aliveness. 12/ The difference in the two kinds of answers is this. There is always a way to solve every business problem for money. And solving for money almost always amounts to solving for survival at the expense of aliveness. If you can't solve for survival, solving for money defaults to solving for the most lucrative death: harvesting a market or breaking up and selling a business. 13/ Sometimes, survival IS at stake, but when you make solving for money your primary mode of operation, you will drain the vitality from the business, and it will no longer serve the human need: something onto which you can project your own need to come alive in a fertile way. 14/ The promise of the economy in a liberal democracy is not just "buy all you can buy" as a consumer, but "be all you can be" as a producer. As Edmund Phelps argued in Mass Flourishing, when work is challenging, people thrive. 15/ To come alive through work, you have to find a deeper motivation to work on business problems than money. You have to solve for aliveness rather than money. This is not easy. Not all economic activities satisfy the necessary conditions to allow solving for aliveness. 16/ I like consulting because other people’s business problems have much more potential for solving for aliveness than my own. My personal business problem-solving amounts to random acts of cash-flow management every few months. 17/ The necessary condition for a "solve for aliveness" orientation is that the core work has enough of a unique “shape” that the meta work of building a business around it becomes interesting in its own right. You can't be textbook-driven or formulaic about it. 18/ This usually means that the domain knowledge compounds in a way that requires a special container to hold it. If the knowledge runoff from the operations of a business doesn’t require a special container beyond people’s heads, it’s hard to be interested in it. 19/ Businesses that can grow big aren’t sized by their revenue, market sizes or founder ambitions, but by the knowledge capital storage requirements. The fact that unique knowledge is being created at all is a sign that it is a solve-for-aliveness business. 20/ When you solve for money, business problems are only about as motivating as sudoku, and inspire only about as much imagination. For every business problem, there is a cost-cutting, margin-improving solution you can default to. This is very dispiriting for Jonathan Livingston Corporation. 21/ Money-motivated solutions to business problems tend to have a dull, mechanical quality to them. Even when very exciting, they drain life energy rather than renewing it. You have to go to expensive nightclubs after to try and actually recharge. 22/ Don’t get me wrong. Solve-for-money businesses can be very clever and make lots of money. But money-driven business problem-solving has a sort of lifeless, nihilistic quality to it. The underlying business patterns, like arbitrage, have a zero-sum feel even if they’re not strictly zero-sum. 23/ Three better-than-money motivators for solving business problems are: technology, people, and scale. When you focus on one of these, it’s not that you don’t want to make gobs of money, but that it’s a secondary consideration. You’d rather go bust than make it the primary consideration. 24 / Technology: when technology is the driving motivation for solving a business problem, the renewable payoff loop comes from satisfaction of borderline absurd curiosities. Will it waffle? mindset driven by hunches and raw curiosity about whether something can work. The thrill of watching a new kind of machine come alive. 25/ People: Can people (both as employees and customers) be made to come alive/thrive instead of slouching through life like dispirited zombies? There is something addictive about figuring out problems in ways where you solve for “people aliveness”. Beneath anoydyne buzzwords like "customer delight" or "employee engagement" there is this real thing you can solve for. 26/ Finally, scale in a general sense. Can something be made bigger, smaller, cheaper, more centralized, more decentralized, more/less automated? The payoff here is activating/deactivating a constraint, and rewriting patterns of abundance/scarcity by turning a knob to some extreme limit. 27/ When you have all three going on -- solving for technology, people, and scale -- the business seems to come explosively alive and burst with vigor. As a side-effect, it tends to also throw off cash like crazy. Like a seabird colony, but breeding wealth rather than babies. 28/ The most motivating way to try and solve a business problem is to “solve for aliveness.” All three better-than-money motivators seem to operate by making some new configuration of things come “alive” in some way. The payoff is creating new life, not installing new financial plumbing or wealth-extraction equipment. 29/ The 3 patterns are three ways to create new business life, the creative part of the creative destruction cycle. Money-motivation problem-solving is important but tends to live on the destruction side. Killing a locus of business vitality when it starts to fade, recycling parts. 30/ Arbitrage, hedge funds, outsourcing, real-estate speculation, commodities trading, debt collection: all these kinds of business are on the other side of the fence from “create new life” business motivation. They are “killing” businesses (predictably, people in them like the business-as-war metaphor). 31/ Creative-destruction is of course a fractal dynamic in the economy. Within every business, there are creation/destruction functions and production lines. I have an engineer's biases: in my experience, engineering tends to solve for aliveness, sales tends to solve for money. Marketing, strategy, and finance tend to fall in between. CEOs tend to inherit the orientation of the function through which they rose through the ranks. 32/ Killing takes less imagination than creating life, and is also close-ended by construction. Arbitrage opportunities tend to remove the very asymmetries they exploit. Trading diffuses the information it exploits. Sales saturates a market. 33/ It takes a darker, nature-red-in-tooth-and-claw survivalist type of personality to enjoy this. And lots of money. On the killing side of the economy or an individual business, you need to motivate people with money, preferably offered through a gambling structure. 34/ Killing work is rarely something anyone would “do for free” if they could. Some people do design/art for the love of it even with no money in sight. Nobody does, say, commodities trading or debt collection for that kind of motive. 35/ Mind you, destruction-side businesses and business functions are crucial to overall economic vitality, just like scavenger species like vultures are crucial to ecosystems. That common comparison is a good one though the negative connotations are problematic and dangerous. 36/ Vultures are very important. In India, the vulture population collapsed in the 90s and 00's due to livestock carcasses being full of the anti-inflammatory drug diclofenac, leading to a dangerous ecosystem crisis that has still not been resolved. As a bird-watcher, vultures are quite amazing to watch too, though in a different way than most birds. 37/ Still, humans are even less like vultures than they are like seagulls. We have our repertoire of scavenging behaviors like all species, but scavenging is not our species-defining trait. For better or worse, we come alive through wealth creation, not destruction. 38/ Interestingly, the John Hagel/Marc Singer Unbundling the Corporation thesis identifies the same 3-way partition of business models, for different reasons, but I don’t think it’s a coincidence. 39/ The reason unbundling a corporation into product, customer relationships, and infrastructure pieces is often a valuable thing is that you tap into the three different ways a business can come alive in a given market. 40/ It took me a long time -- 12 years, 6 as an employee, 6 as a consultant -- to really understand what makes a business problem appealing versus unappealing to me. If I can't find a way to view a problem as a "coming alive" problem, I lose interest no matter how much money is involved. 41/ Back when I was struggling to get my consulting off the ground, I took a few gigs that played out in awful, dispiriting ways. Invariably, the reason was that I was working for a person, function, company, or sector that had an overall "solve for money" orientation. No wonder I felt drained. 42/ One sign of solving-for-money is that people and companies that do that typically don't work for themselves in a psychological sense. The ultimate reason why they're doing whatever they are doing is always somewhere else. They can only measure their own work through money. 43/ The more basic measure of value always lies a couple of degrees away for such actors. With the "customer" or the "senior executive" or "public sentiment." Solve-for-money types are always working on "deliverables" to people with better reasons to be doing whatever they are doing. 44/ I don't like "deliverables". The word is almost invariably used to scope work in ways that make it measurable by money. I like relationships where both sides are trying to figure out how to come alive through the shared work. Usually this means messy, iteratively defined scope, with "done" being a post-hoc consensus assessment rather than a deliverables checklist. 45/ This has led me to an interesting new definition of free agent. Whether or not you are "free" is not a function of you are inside a corporation or a consultant/contractor, but a function of whether you are solving for money, or solving for aliveness. Solving for money is a sign others control the reasons why you're working. They may or may not find your "deliverables" useful, but you get paid either way. 46/ Anybody who solves for aliveness tends to, in some deep sense, work for themselves. Companies with a critical mass of such people also tend to solve for aliveness at the corporate level. These are Jonathan Livingston Corporations. 47/ Freedom lies in the privilege of being able to solve a problem for aliveness, rather than money. Anyone who has, or seeks, such freedom is a free agent. You can't always get it, but if you're not always striving for it, you're slowly dying rather than coming alive. 48/ So how do you turn a quarterly-horizon, cost-cutting, bean-counting, bottomline-driven, solve-for-money business into a solve-for-aliveness business? This is the Jonathan Livingston Corporation problem. 49/ I think there's really just one rule: don't work for people who don't work for themselves. By which I mean they don't own the main reason they're doing whatever they are doing. Of course the reason has to be one that aligns with yours, but it needs to exist first. 50/ Money is never an answer to the question, "why are you doing that?" It is code for "the reason is somewhere else." Sometimes, for a while, the reason is somewhere else for a good reason, but if it's always somewhere else, work will only ever be what you do for money, never part of who you are. Which, for a human being, as opposed to as seagull, is a tragedy. Copyright © 2018 Ribbonfarm Consulting, LLC, All rights reserved.